If you’re sick and tired of reading about LifeMiles, rejoice – this is really going to be the last chapter in my Avianca series. I was going to call it quits with my previous installment, but with every new search, I kept finding more and more Avianca sweet spots. In all honesty, I’m starting to regret not paying attention to this program (not being a “career” travel hacker, you know) when things were really interesting, before most of the Avianca awesome hacks were killed. But it’s not just that. The Avianca LifeMiles award sale only covers Asia, but it’s more than just Asia, as there are great values all over the globe. Before we go any further, let’s recap first. Here are a few Avianca sweet spots created by the Citi 25% transfer bonus (for traveling to/from the U.S. unless stated otherwise). Note that these values don’t reflect the current LifeMiles award sale, which is also slated to last until December 12. If you take into account those sales, you can get values that are almost unreal. And then there is Skiplagging. Skiplagging is a the practice of throwing away the last leg(s) of your flight in order to save on airfare. It doesn’t often make sense for award travel, but as we’ve demonstrated in this series, it makes perfect sense with LifeMiles. This is a bit more complex, so I really recommend reading Part 2 of my Avianca series more carefully, but here are a couple of great examples. If you fly directly to Japan in First Class, that’s going to cost you 90,000 miles or 72,000 Citi points (which is not too bad, I agree). But you can make it much better by booking a flight to Hong Kong via Tokyo and skipping the second leg between Tokyo and Hong Kong. That’s going to cost you 74,480 miles or 60,000 Citi points. Isn’t it great? As I’ve said before, I don’t get why our fellow hobbyists are so obsessed with this Lufthansa First “experience” (perhaps I need to try it to find out 🙂 ), but adding another leg allows you to visit places other than Frankfurt or Munich and save a lot of miles in the process. You can fly directly between the U.S. and Munich or Frankfurt for 87,000 miles (which is a lot miles) or 68,000 Citi points (much better). But you can also fly from the U.S. to Reykjavik (with the second leg between Frankfurt and Reykjavik in Business Class) for 79,280 miles or just 64,000 Citi points. This would be an OK value even to me, and I’m quite miles-stingy as I’m sure you’re already aware. Again, please read Part 2 of my series to find out if skiplagging is right for you, because there are some risks involved. Alright, so since I simply can’t stop and love playing, I kept at it and found out a curious thing. 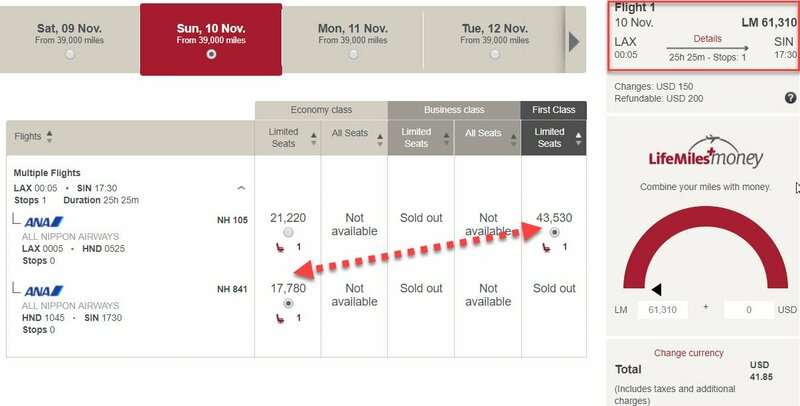 So we know that according to the LifeMiles chart, a Business Class award seat between LA and Singapore is on current award sale (14% discount), so subtract 14% from the regular redemption rate to South Asia, which is 78,000 miles, and you’ll arrive at 67,000 miles combined as stated in the screenshot below. But then how do you explain the First Class pricing? I took it all way down to the payment screen, short of making an actual booking. Is it a bug that won’t ticket? I have no idea. All I know is that flying to Singapore for 68,830 miles (56,000 Citi points) with the Tokyo leg in First Class is beyond amazing! Noticed something else? Here is another screenshot that’s a little less busy. That’s right! Skiplagging can get you to Tokyo for 61,310 miles or 50,000 Citi points. 50,000 Citi points for a First Class seat to Japan. Without any fuel surcharges. Insane! Again – if it actually tickets! 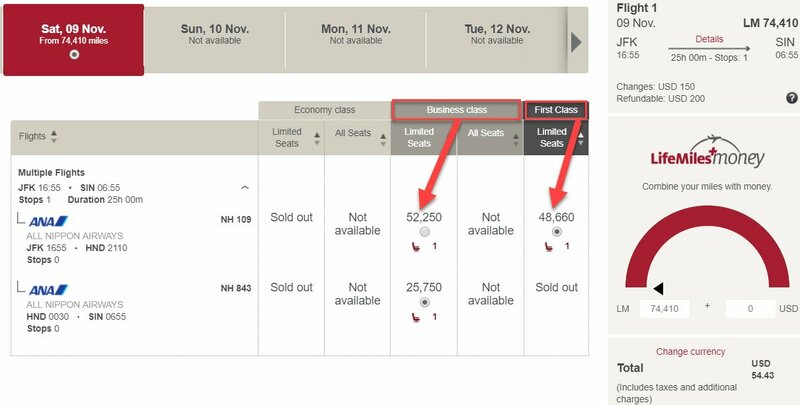 A Business Class seat is priced 100% correctly, at 78,000 miles (there are no current award sale discounts between New York and Singapore). First Class, on the other hand, is 3,590 miles less. Say what? Like I said – funny! By the way, Singapore is hardly the only ANA destination that exhibits similar anomalies. Here is New York to Bangkok via Tokyo. And once again, First Class above is priced only 1,330 miles over Business. Is it always the same way on the Bangkok route? No. 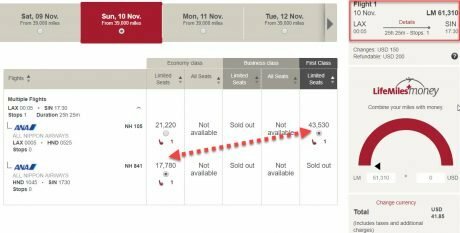 I’ve tried multiple dates, and it seems only the morning flight NH9 has this, hmm, peculiarity, while the afternoon’s NH109 is priced correctly for both Business and First Class seats. Like Frequent Miler, I also feel that I’ve barely scratched the surface (once again, read his excellent piece to better understand how skiplagging and Avianca’s mixed award pricing work). But suffice it to say, Avianca LifeMiles offers a lot of opportunities to anyone who’s crazy enough to spend hours researching their options. And because it’s so gamable, I’ve done something I rarely do – I’ve transferred all my remaining Citi ThankYou points to LifeMiles speculatively despite not having any redemptions in mind. After this and my last transfer to Virgin Atlantic, I now have only a few hundred Citi points left. 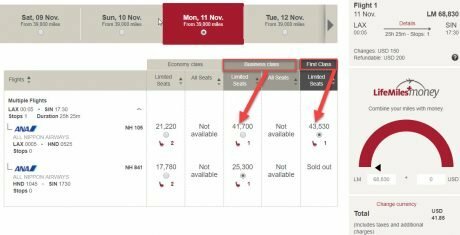 Now come to think about it, Avianca has also been selling miles like crazy recently at a huge discount; why would they be doing that, hmm…? You think, something might be coming? I’m confused why you are suggesting skipping the final leg of the journey when the miles are tied to your account. This seems like an easy way to get a ban. Which is why I’m mentioning the risks associated with this method. While I don’t believe I’ve ever heard of anyone being banned for “missing a flight” once or twice, if you do it systematically, then yes, you’re running a risk. 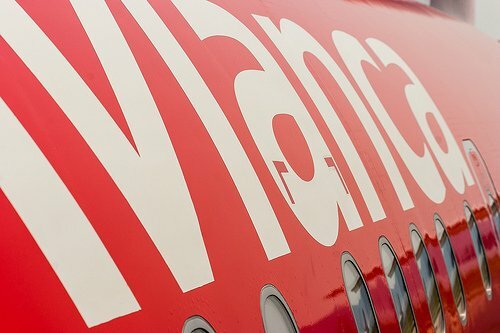 Avianca has had cheap point sales for a number of years now. Never took advantage, only bought points to top up an account or extend an expiration. I opened their credit card a few years ago and used the 63,000 points to book Business on Swiss from ORD to Rome. Used 17.5 points to book a flight from Cairo to Nairobi next September. United wanted 30k. Ron, thanks for your comment. Yes, I’m aware it wasn’t their first award sale, but it coincided with the Citi bonus, too. Hopefully, they will offer these transfer bonuses again to both Citi and Amex customers.